Add tomatoes to blender and make it to puree.set aside. In a bowl, mix 1tsp turmeric and 1/2tsp salt with cooked egg. Heat oil in a pan and add egg and fry till golden brown.Remove them & keep aside. To the same pan add bay leaf and cumin seeds. Allow them to splutter. Add chopped onions and fry it till it totally soft and golden in color(5 minutes). Then add tomato puree, ginger garlic paste, coriander powder,garam masala powder. Add ¼ cup water, 1 tsp salt, turmeric powder, red chili powder and mix them well. Cook it for 5 minutes until mixing all the ingredients properly and oil separates. Then add the fried eggs and a cup of hot water. Simmer the gravy on low flame for about 10 minutes. Now sprinkle roasted cumin powder, sugar, coriander leaves and green chilies and simmer for 2 minutes. 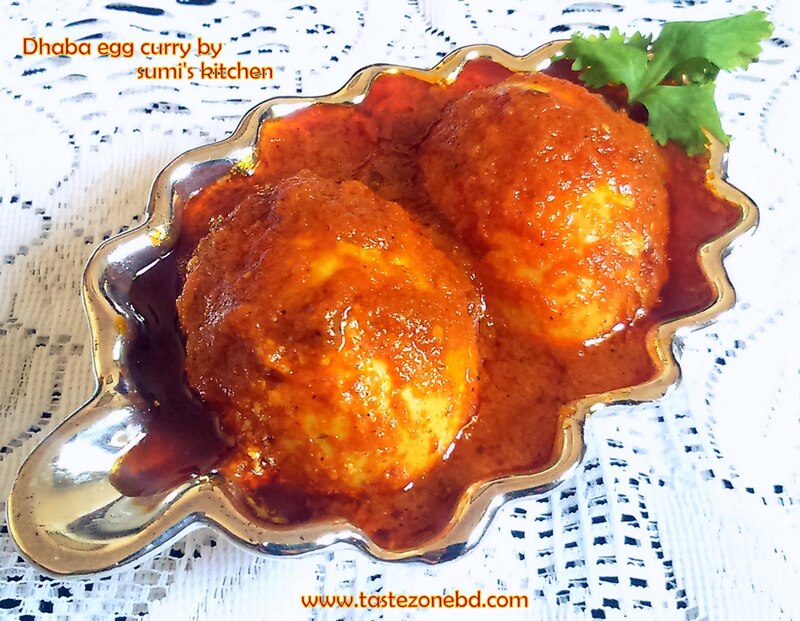 Delicious dhaba egg Curry is ready. Garnish with coriander leaves and chopped ginger. Serve Boiled or fried rice and Salad.